Cardiologists at Ronald Reagan UCLA Medical Center have completed their first transcatheter aortic valve replacement (TAVR), a new minimally invasive procedure that doesn’t require incisions in the chest wall and cardiopulmonary bypass. UCLA has performed its first transcatheter aortic valve replacement (TAVR), using a new device approved by the U.S. Food and Drug Administration to replace an aortic valve in a patient who was not a candidate for open-heart surgery. The procedure took place on Aug. 9. Ronald Reagan UCLA Medical Center is part of a growing trend of hospitals nationwide offering this new minimally invasive procedure. As the U.S. population ages, an increasing number of patients will develop aortic stenosis, a narrowing of the heart’s aortic valve caused by calcium deposits, which impedes blood flow, causing the heart to work harder to pump blood to the body and placing patients at higher risk of heart failure or death. Although minimally invasive surgical procedures have been used on the aortic valve in the past, these operations relied on incisions in the chest wall and required cardiopulmonary bypass. The TAVR allows doctors for the first time to replace the aortic valve without either of these components of conventional surgery. The aortic valve’s leaflets act as sentries to help blood flow from the heart into the aorta while preventing blood from leaking backward into the heart. When the leaflets aren’t doing their job properly due to aortic stenosis, the heart needs to generate higher pressure to push the blood through the valve into the aorta. Patients with aortic stenosis have a number of symptoms, including chest pressure or angina, shortness of breath, edema, and fainting. Many patients are not good candidates for conventional valve replacement because they suffer from a number of other health issues, and it is estimated that 40 percent of patients do not undergo aortic valve replacement because they are considered inoperable. The new device is deployed through a catheter — a long tube that is advanced through an artery in the groin up to the heart. Once in place, a balloon at the end of the catheter is inflated, opening the new valve, which starts working instantly. TAVR is the latest in a trend of major surgical procedures now being performed without invasive surgery at UCLA. The team’s cardiologists, heart surgeons, anesthesiologists, nurses and technologists work closely together to address the needs of each individual patient. Studies have shown the new valve procedure dramatically improves quality of life and survival rates. A recent randomized clinical study showed a significantly higher one-year survival rate among patients treated with the new valve, compared with those who received medical therapy. 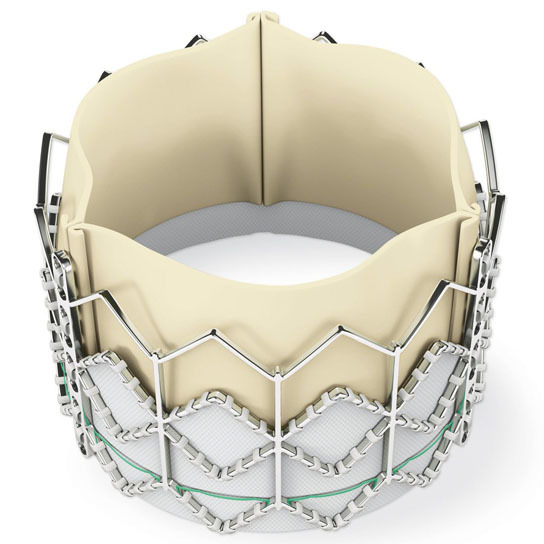 For more information about the new TAVR procedure at UCLA, please visit www.uclahealth.org/TAVR or contact 310-206-8232. Be the first to comment on "UCLA Cardiologists Complete Their First Transcatheter Aortic Valve Replacement"